Open Enrollment for Kids ages 4-7. Get your child moving and grooving with OSP! 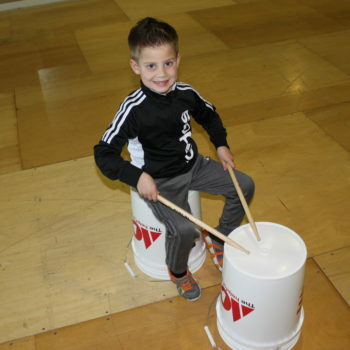 Junior drum club (JDC) is a club designed with the purpose of giving kids ages 4-7 the opportunity to learn music in a structured environment, with instruction by members of OSP. This class is designed to have both the child and his/her parent(s) together, side-by-side learning a variety of different drum rhythms and rudiments while making music together. Buckets, trash cans, and a variety of homemade instruments are the tools used for instruction during JDC. There is a cap of 20 kids per class. Enrollment is strictly online, on a first come first serve basis. Enrollment will close each month after 20 students have been registered. Name of the Parent/Guardian who will be attending the class with the child. After “Submitting” the information you will be redirected to Paypal for payment. You will not be registered for the class until payment is complete. Drumming 101. Learn how to hold drum sticks and how to properly hit the drums. A variety of voice commands will be learned as well. Simon Says...OSP STYLE! A simple call-and-response game using various drum rhythms. Learn to count and play rhythms in patterns of 4, 8, 12, and 16 count phrases. Opportunities to play on buckets, trash cans, shakers, and other standard OSP equipment.